Canada Elderberry flowers from early July to mid August in Central Minnesota. This is one native shrub that was present in our yard when we purchased our home. It grows in the lowest lying (moistest) spot in the yard under mature black cherry trees in part sun. The flat topped inforescence is very showy and fragrant - usually 6 or more inches in diameter made up of many 5 petalled tiny white flowers. Many nectaring insects (bee, fly and beetle species) as well as butterflies are attracted to the flowers. 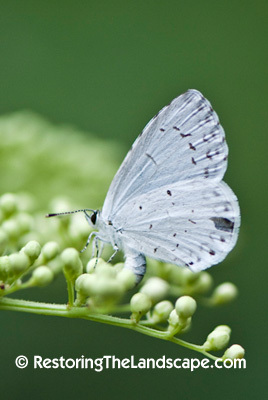 One butterfly that seems to particularly like this plant is the Summer Azure (Celastrina ladon neglecta). This is often a difficult butterfly to photograph because they're very skittish. They do however spend quite a bit of time nectaring on the elderberry flowers. This photo shows the female depositing eggs on the inflorescence. 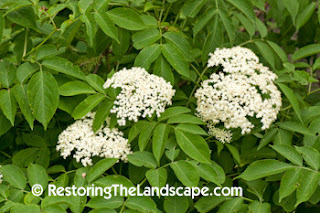 The other elderberry common in Minnesota is the Red Elderberry (Sambucus racemosa) which flowers much earlier in late May with more conical shaped inflorescences and bright red berries in late summer. 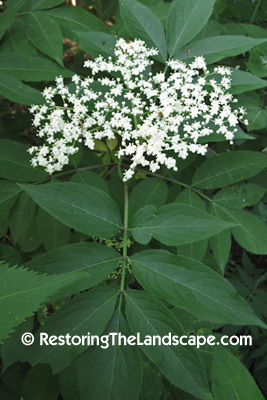 Canada Elderberry's native habitat is in low lying moisture rich soils along lakes and streams in sunny locations. 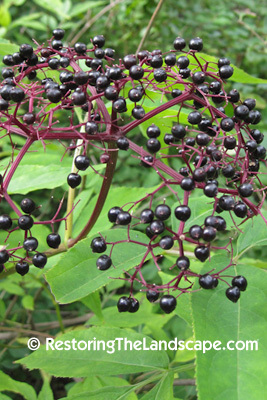 The Red Elderberry is much more adaptable to dry woodland openings than the Canada Elderberry. I chose to highlight it as the Native Plant of the Week because the ripening berries are very showy right now. They turn a shiny blue-black when mature and are held by bright pink petioles. The berries are highly sought by many bird species and thus the seed gets dispersed. The berries are edibe and were used by early settlers for the use in pies and jams. 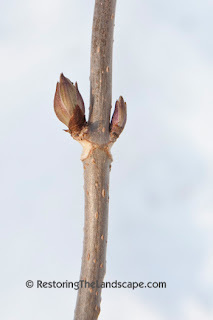 Elderberries provide a long season of interest from their early leaf buds swelling in late February to their showy flowers in July to their heavy deep blue black fruit set in September. The one thing that frustrates gardeners with this plant is its weak woody stems that break easily and often die back substantially each season. It therefore needs a little extra attention in a managed landscape to keep it looking balanced. In a less formal wildlife garden, the pithy stems provide cavities for insect species to overwinter in. Canada Elderberry is an native to most of North America except for the northwestern States and Provinces, northern Canadian territories and Newfoundland.